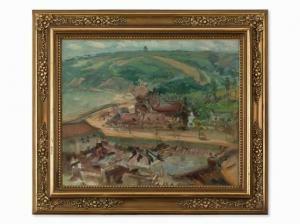 Find artworks, auction results, sale prices and pictures of Constantin Kousnetzoff at auctions worldwide. 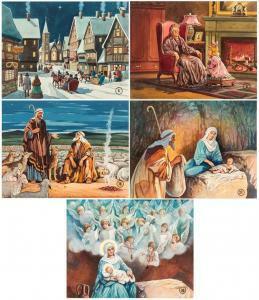 A GROUP OF 36 PAINTINGS BY KONSTANTIN KUZNETSOV (RUSSIAN 1895-1980) 36 Gouache Paintings for a Christmas Story, gouache on paper 20.3 x 26.4 cm each (8 1/8 x 10 3/8 in.) LOT NOTES These are the original drawings created by Konstantin Kuznetsov as a part of a series of images used to accompany the narration of the story of the birth of Jesus. Konstantin Kuznetsov was born in 1895 in St. Petersburg and became a very well known illustrator in the Soviet Union. As of 1944 he was in a prisoner of war camp in Yugoslavia, and after the war would later live in Munich before emigrating for the United States in 1950, where he would continue his career as an illustrator. Kuznetsov died in Los Angeles in 1980. Constantin Kousnetzoff (1863-1936), River Landscape, 20th C.
73 by 100cm., 28 3/4 by 39 1/2 in. 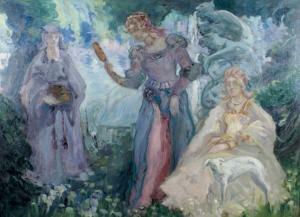 a contemporary of konstantin korovine, kousnetzoff was born in nizhny novgorod into a noble and rich family. 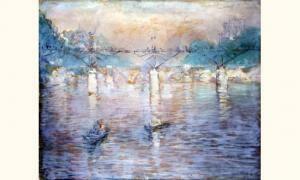 in 1896 he left russia to continue his education in the art centres of the world, came to london, paris, rome, and florence. he finally chose to settle in france where together with borisov-musatov and shervashidze, he attended the atelier of carmon. 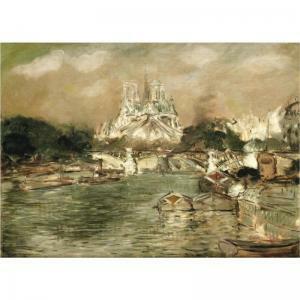 though he predominantly painted landscapes of france he exhibited regularly both in paris and in moscow and st. petersburg. the bolshevik revolution in russia cut him off from his country; he continued his work in france; in 1927 he settled in paris, painting its squares and embankments, which on his canvases look both lyrical and mystical. though his works are very little known in russia for obvious political reasons, his paintings are a fine example of true russian impressionism. provenance: family of the artist d'atelier 1926. inventory number 30 in the family archives of monique vivier-branthomme. numbered on the reverse 654.